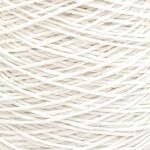 ?> Craft Cotton - Dishcloth Cotton in two colours on 200g cones. Dishcloth cotton or craft cotton is a term generally associated with simple, unfussy soft cotton yarns at a budget price. 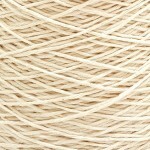 The surface is slightly textured and you may even see a small fleck of the natural cotton seed between the strands. The ecru is "scoured" and in its natural state with the white having been "bleached" to create a fresh, bright optic shade. It&apos;s strong, durable, economical and repeatable…and unusually on cones rather than balls. A great yarn for beginners whether learning to knit or crochet, weave or macrame, dye or knot. Unlike mercerised cottons, soft cottons have a matt finish and soften up over time when washed and tumbled. Knit or crochet into dishcloths or facecloths for a brilliant eco product or gift – much better for you and the environment than wet wipes. For those learning to weave, craft cotton makes a perfect warp yarn on small looms such as hand looms, rigid heddle looms, card looms or small tapestry looms, but probably not strong enough for floor looms or big tapestry looms. 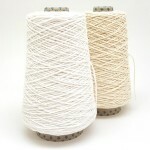 Knot or braid into chunky creations and fantastic for macrame without having to spend lots on smooth, expensive cords. If you&apos;ve never tried your hand at dyeing then this is a great yarn to practice on. Cotton needs a cold water or natural dye and will slurp up the dye to create bright, fresh shades. A simple yarn at a great price on handy cones in two classic colours.